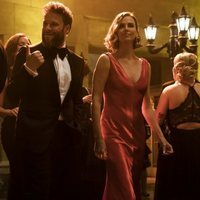 Fred Flarsky (Seth Rogen) is a talented journalist who is moved by his free spirit and has a powerful magnet for problems. On the other hand, Charlotte Field (Charlize Theron) is one of the most influential women in the world. She is intelligent and sophisticated, a diplomat with talent for almost everything. The only thing they have in common is that she was his babysitter and Fred's childhood and first love. Both are reunited because of their jobs and the chemistry between them intensifies with each incident they experience. Charlotte prepares to be selected as president and Fred helps her prepare her speeches, but he is not prepared for the glamorous and celebrity lifestyle that Charlotte usually lives.